Celebrate your love of God and music. 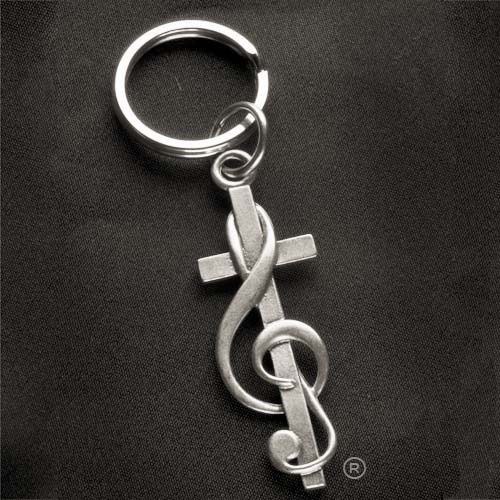 The CrossClef is jewelry, apparel and gifts for Christian musicians, choir members, and everyone who celebrates God with music. Inspired by, and in tribute to, the generous spiritual life of Chuck Risser, the CrossClef celebrates the glorious connection between music and worship. If you are unsatisfied with your CrossClef item for any reason, you may return it and we will happily send you a new one or refund your money – whichever you prefer. Like CrossClef on Facebook, Follow on Twitter and Instagram, and sign up for our Newsletter to get exclusive discounts and giveaways only available via these outlets. Thank you! I was not in the office on Thursday and that is when the BEAUTIFUL items arrived. (Well in advance for our Sunday Appreciation Mass)! They are absolutely spectacular and truly like the picture on your website. I just wanted to let you know that I saw your ad on Facebook, and I clicked, browsed around and instantly bought a CrossClef necklace. I love the story behind your work and the fact that it has meaning. And, being a graphic designer I love your branding and website as well. (I would like to have seen what the pewter necklace looked like on a person instead of by itself.) But GREAT job! I’ll keep you all in my prayers and look forward to what God has in store for you in the future. I was searching google for a childrens choir charm for the director in sterling, but couldn’t find it. 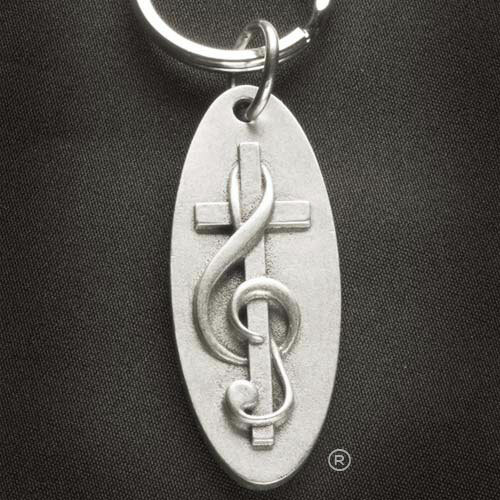 Then I found your site & liked this pendant key chain with the scripture on it. I believe she will love it. Thanks again for your quick response, I truly appreciate it. I just received the order. Thank you for all that you did! I have already received comments at church about the silver necklace I ordered previously. Our music minister had ordered coffee mugs from you and had given them to everyone in the choir and instrumental ensemble. Everyone loved them. I will be a walking advertisement for you! 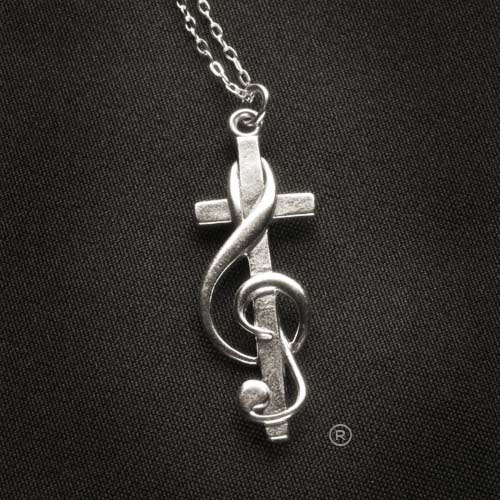 I am wearing the pewter necklace to choir practice tomorrow night. We considered a lot of different gift ideas – plaques and Christian art, etc. – but there’s only so much of that any one home can accomodate. We could get a regular cross – but they already have cross necklaces. But this was unique – connecting their Christian faith and their love of and gifts for music. So, we agreed that your CrossClef jewelry was the way to go. 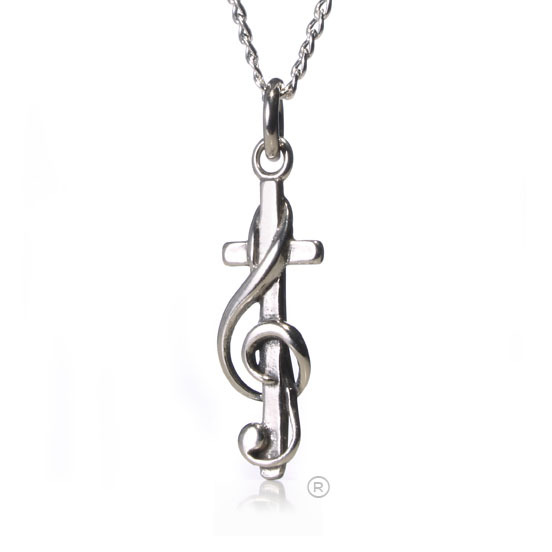 A year ago I was searching for a necklace with a Christian music design for my daughter. 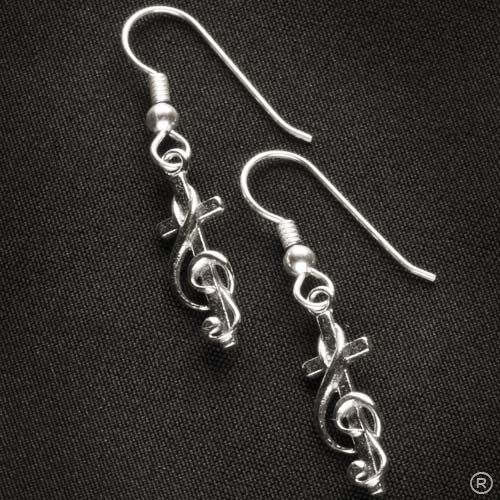 At some point I recall finding some other cross and treble clef designs for pins and such. At that point I had a vision of what I was looking for and was pretty sure someone must be making it. Your design was basically what I was hoping for. Of all the artistic variations I’ve seen, your design is the best. Thank you, this is awesome!! I will tell people about your website. The package just arrived and it’s lovely. I’m sure our friend will love it. …I had been searching for quite awhile for a special gift and was thrilled to find your site. I bought quite a few of your jewelry few years ago at Monterey Spirit West Coast and I just fell in love with the design. I received my order this morning and it was GREAT! Just what I was looking for, for so long. Thanks!!!! 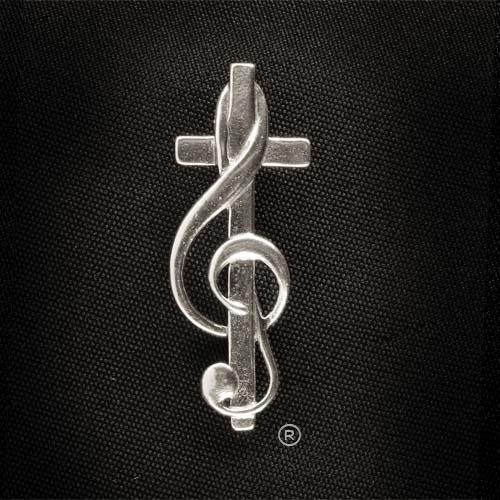 Your CrossClef was the only, and nicest gift I could find, and honestly, it IS the perfect gift for a person in the music ministry! I love it, and am so excited to be able to gives these as gifts!! Thanks again! I just came across your site through an ad on Facebook. I love your product design! Just wanted you to know the Cross Clef arrived today, it’s simply gorgeous, and so well packaged and presented. I think she is going to love it! I saw your ad on Facebook and really enjoyed the necklace and earrings. We’re currently making some changes to some of our items. If we are out of stock on the items you want, we’ll let you know. Meanwhile, if you’d like a promotional code for 25% off your next order once we’ve re-stocked everything, please enter your info below. The promo code will be sent to you after we’re fully restocked. Thanks!